We are pleased to announce the launch of our ‘Social Media Survival’ project on Indiegogo.com. As we have warned many times before, it’s important to understand that just being active on Facebook makes you a potential target of hackers and scammers. 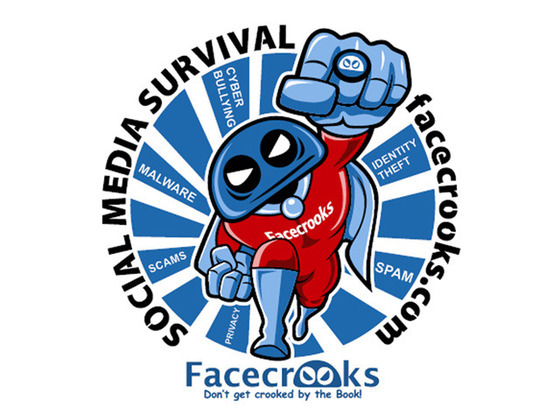 Facebook’s one billion member user base is a huge attraction for cyber criminals. Facebook users should be aware of the dangers and pitfalls that await them and their loved ones on social networking platforms. We are very excited about the cyberbullying segment of the project. The theme is Stand Up, Stand Out, Stand In. Our goal is to work with high school theater departments to create compelling video content that encourages students to stand up for themselves against bullies, to stand out and express their individuality with pride, and to stand in for others who are being victimized. We encourage drama departments to contact us at info[at]facecrooks.com for guidelines and submission details. For those unfamiliar with Indiegogo and other crowd-funding platforms, the process is simple. If you believe in our cause, then you contribute at varying levels, the smallest being just $5.00. Your contribution entitles you to certain ‘perks.’ These include t-shirts, sticker packs and other items displaying our logo and project graphics. Other perks provide personalized safety instruction, educational items and the opportunity for sponsorship and collaborative endeavors. We would like to thank all of our 188,000+ Facebook followers, and those that are regular readers of our blog. Please visit our project page on Indiegogo, and please share it with your friends. We appreciate your support!